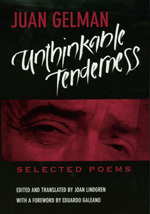 The author of twenty books of poetry, Juan Gelman has long been counted among Argentina's leading poets, though all but unkown to English-language readers. For Unthinkable Tenderness, editor-translator Joan Lindgren has selected ninety-three poems to form a narrative of Argentina's recent history as seen through Gelman's eyes. Poetry that reverberates with the melancholy poetics, the wistful, even obsessive, music of the tango--which Gelman has laced with Spanish and Jewish mysticism--its themes are love and exile, torture and the disappearances of the Dirty War, which include the poet's children and closest colleagues. Its shadow is the beloved, the homeland, Argentina, as it is, as it can and must be. A new foreword by Eduardo Galeano, along with the translator's preface and a newly translated foreword by Julio Cortázar, introduce these poems; an epilogue by Juan Gelman ends the collection, which is followed by chronologies of Argentina's Dirty War and of Gelman's life and works. Juan Gelman is Argentina's leading poet, but his work has been almost unknown in the United States until now. In 2000, he received the Juan Rulfo Award, one most important literary awards in the Spanish-speaking world, and in 2007, he received the Cervantes Prize, the Spanish-speaking world's top literary prize. With this selection, chosen and superbly translated by Joan Lindgren, Gelman's lush and visceral poetry comes alive for an English-speaking readership. Gelman is a stark witness to the brutality of power, and his poems reflect his suffering at the hands of the Argentine military government (his son, daughter-in-law, and grandchild were "disappeared"). While political idealism infuses his writing, he is not a servant of ideology. Themes of family, exile, the tango, Argentina, and Gelman's Jewish heritage resonate throughout his poems, works that celebrate life while confronting heartache and loss. Born in Buenos Aires in 1930, Juan Gelman went into political exile in Europe in 1976, where he remained until 1989. Today he lives in Mexico City. Joan Lindgren spent seven years studying Gelman's work and made six visits to Argentina while doing her research.